Then there is Winnipeg. Flat, boxy, constant, prairie-values Winnipeg, the railway hub born in the hopes it would become the next Chicago, but ended up as Dubuque with more snow. 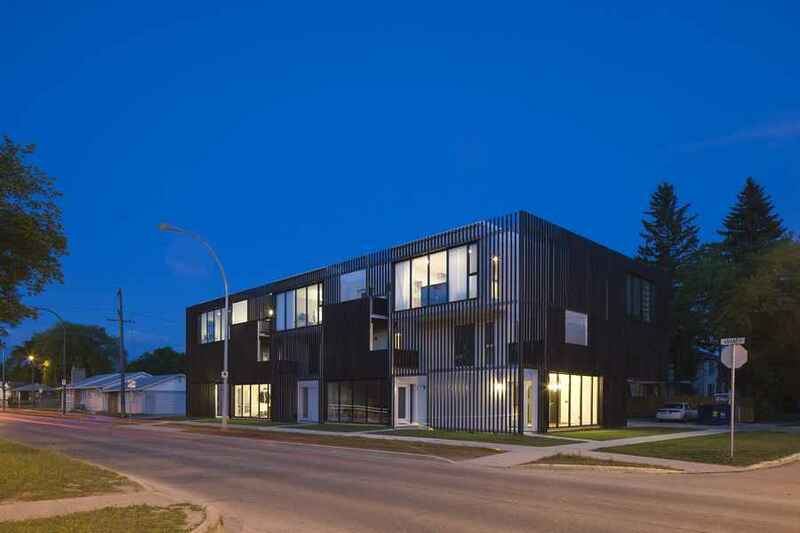 It is no accident that humble, isolated Winnipeg has created Canada’s most exciting new architectural firm in a decade, one dedicated to applying design innovation to the humblest of tasks, a plains-born, good-humoured, resolutely resourceful verve for building housing modestly, but with elegance. This is all in evidence in Block 10, one of the more accomplished works to date from the telephone-numbered young firm of 5468796 (don’t bother dialing—their number has been changed!) To their credit, 5468796 is dedicated to changing the number on the sometimes profound, sometimes fey line of precious wood-and-concrete pavilions and villas in natural settings that has defined Canadian architecture for a generation, notably through the designs of Toronto’s Shim + Sutcliffe, Quebec’s Pierre Thibault, and fellow native Winnipeggers, John and Patricia Patkau.